The final day of July yielded good passenger numbers for a Sunday. Of course supported by the buffet. Down the yard, progress was made on "Barry". Part of the bodyside was filled and sanded and a great big patch was welded in. Picture attached. Over the way, the Derby Lightweight power car had all sorts of things removed from it. Nobody knows whether these will go back in the right place when the time comes! Work progressed on Faraday also, with attention turning to the donkey engine. One of those things that a driver would hope they would never need but its a good backup. A boffin was working on the webcam system. If trials are successful, we hope to run the website upload part of the system from a Raspberry Pi. To the user there'll be no difference, to us though we will have removed a 400w power supply which runs 24/7 from the electric bill! The CCTV portion is separate of course. A dull and quiet day where we played host to a Drive a Diesel Railcar Day, ably hosted by Lewis and Richard. They took in some of the line in the morning, allowing Mick and Rob (on loan from the Maintenance Dept) to drop some stone near footpath 3. The experience then did the whole line later in the afternoon. The Catering were in full swing, firstly feeding our experience guests, then preparing for tonight's dining train. The only people down the yard were the tram guys. Two meetings were held this afternoon at Duffield. The first with the team who normally look after Wirksworth, as they have offered their assistance with the internal fitting out of the new Booking Office at Duffield. Some of them had never even been to Duffield until today! Secondly, we met with the electrician and tried some sample lighting which looks impressive. One of our regular mytesttrack.com customers undertook a training programme for their measurement equipment over two days this week requiring great concentration. A damp and miserable day today saw it become the quietest day of the week on the trains but still not without loss. This was also boosted by a party booking for the Tunes and Chips special in September and also the charter taking place this evening. A meeting was held with the Derbyshire Wildlife Trust and the Amber Valley Ramblers today which was positive. There's a walking route identified between Wirksworth and Duffield for ramblers to use through the countryside and along the river. There's an accompanying leaflet with a map. Hopefully there'll be a positive relationship to enable people to walk in one direction and catch the train back or even to intermediate stations. Down the yard, investigations in to a vacuum cylinder fault with 55006 continued but to no avail. The fuel tanks were also dropped down from the Derby Lightweight power car 79018 and apparently it's a good job too as there's a rather large hole at the top where the breather should be. Wouldn't want to be wasting any liquid gold! The fork lift truck had what would, in railway terms, be an FP exam with the engine oil, radiator and greasing being carried out. 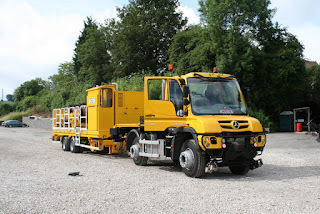 Today saw us helping to test a vehicle destined for the Tyne and Wear Metro designed to assist with the renewal of the overhead contact wire hauled by the ever useful Unimog. Another warm day where the till almost matched yesterday, to the penny. Not that it's a problem! Lots of progress near the engineerium today with many bodies tidying the stores. Faraday had the running boards needle gunned and a start was made on repairing the engine bay covers. The Duke team were in at the back of the shed. Wood was seen passing, which I assume is for their box van. We were blessed with glorious sunshine today. The morning started with a steam footplate experience which was very well evaluated by the driver and his family. Our two car 'Metcam' set provided the traction for the Duffield Service which enjoyed good visitor numbers throughout the day. On the incline spare a thought for John and Pete who worked on an extremely hot footplate to deliver our scheduled incline steam service. Similar to last weekend this proved very popular today with extra services being introduced to cope with passenger demand. A quiet day down the yard with a small number of steam restorers continuing work on the Duke. The DMU Team were displaying their extended skills as a trio set about dismantling the the webcams and relocating them in preparation for the dust dock demolition. In the training room John Ball delivered a first aid course and congratulations to David Lee who passed out today as a DMU guard. Today's service was supported by the EVRA shop and model railway. The Pullman Buffet was an oasis today doing a roaring trade in ice cream and cold drinks. Finally earlier this evening the Catering Manager took a phone call from Arizona. A customer who is visiting the UK next week has booked a table on Tuesday's tea train! Our reputation knows no boundaries….. 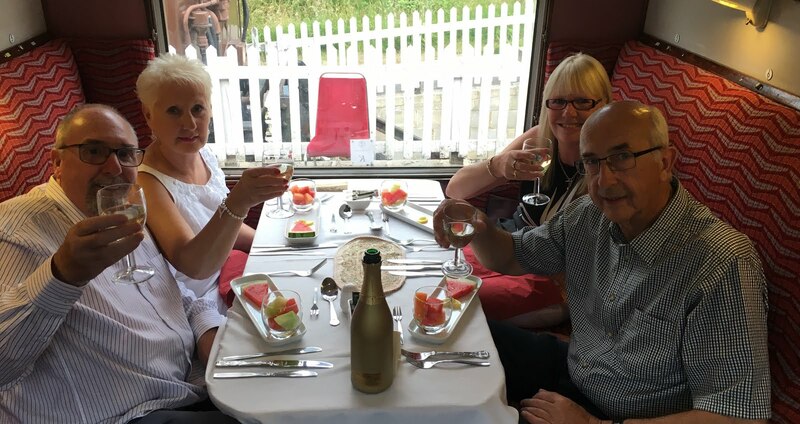 The Evans's & Tait's became not so secret, secret shoppers this evening as we joined a packed dinning train at Wirksworth Station to sample our customers' dining experience. At last weekend's Annual General Meeting Neil gave a comprehensive overview of our railway's progress and likened it to a small football club gaining promotion to a higher league. It is easy to forget that our evening meal trains are only two years old yet thanks to Eric Hills and his excellent team the quality of the meal and customer care was premier division standard. Without exception customers we spoke with were very complimentary about their experience and went home as extreemly satisfied customers having enjoyed a very pleasant evening. Praise is also due to the train crew under John Evan's management who created a friendly and relaxed atmosphere that ensured passengers had the time enjoy a slow and steady journey along the valley taking in the beautiful evening vistas. Thanks also to the Class 25 crew who's gentle braking and acceleration ensured not a drop of bubbly was spilled! Finally a special mention must go to Helen and Anne who worked without the aid of a fan in a very hot kitchen to create such a well prepared and presented meal. My vegetarian tartlet was exceptionally tasty! 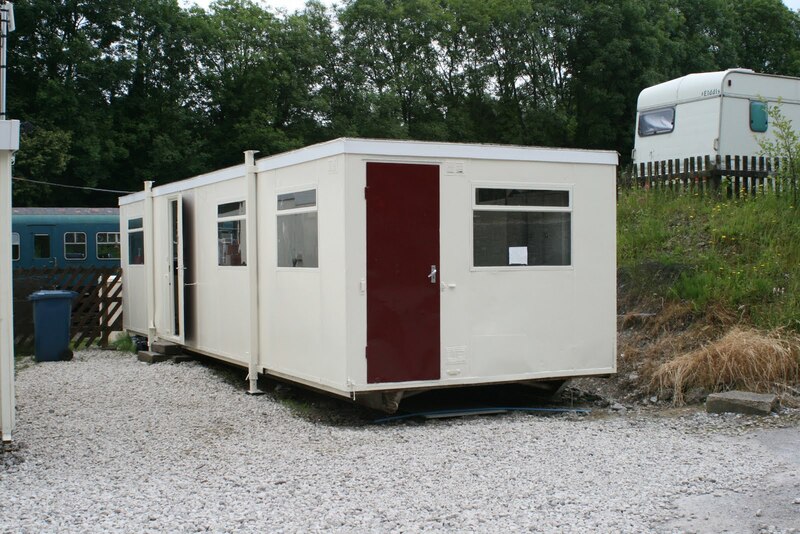 In conclusion, I think its fair to say our railway's catering has taken a quantum leap in the last year or so with the provision of well restored dining stock by the LMSCA and a high quality dining experience delivered in a friendly and professional way. Many thanks to everyone who made tonight such an enjoyable evening. Your hard work was certainly appreciated by all your guests. Photo's attached are of four happy dining guests and the train arriving back at Wirksworth at 10:15. Not quite so warm today which must have attracted the passengers as it was the busiest of the three mid-week operating days this week, parties excepted. The PW team were working at Barnsley Lane whilst the DMU team worked away near the Maintenance Facility. They have finally succeeded with 50253 having changed the air intake and another lift pump on No.1 engine all seems to be well. Derek and Dan were working in the compartments on BSK 34625 now its a twinge cooler. It took a long time coming but it has been the hottest day of the Year. The service train today was the loco hauled stock with the Buffet staff doing brunch and afternoon teas with our resident class 25 working faultlessly in the hot weather. Good numbers were recorded and the service was supported by the Model railway and EVRA shop. 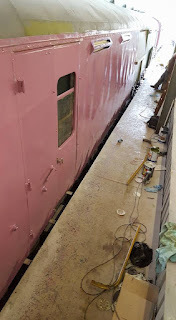 Trying to paint was impossible as Mick Ball found out in the LMS brake van. The paint became too hot and sticky. It was a bit cooler in the maintenance Facility as the rest of the Steam Team worked on Cathryn's axleboxes. 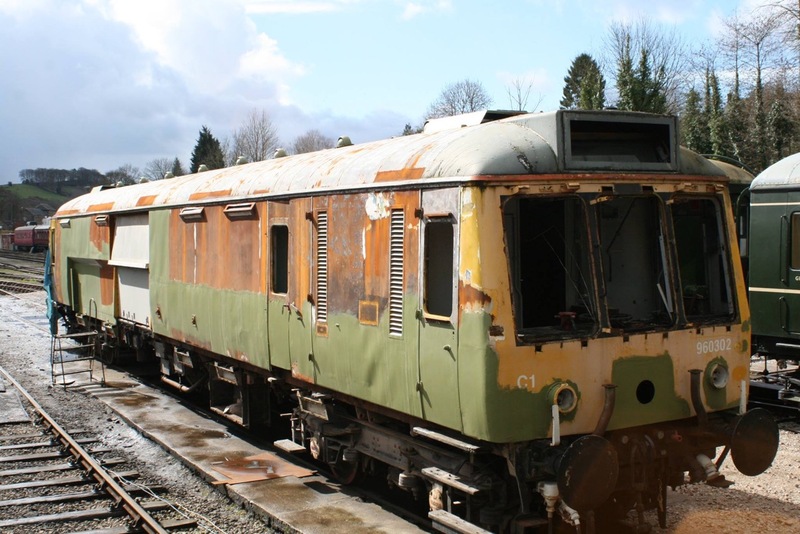 A few shareholders were enquiring as to the progress of Class 121 'bubble car' 977975 which WyvernRail purchased for the Permanent Way team a couple of years back. There will be a brief article in the next Association magazine but for those interested I thought I would let you know progress so far. The vehicle seems to to have affectionately become known as "Barry" and I'm not sure whether this alludes to the previous location of the vehicle or whether it's just because it alliterates with the word "bubble". Maybe a combination of both! Some while back the vehicle was sandblasted so that you can "see the wood through the trees" as they say. This revealed quite significant rot to the metal work which was previously well hidden by years of filler and paint. The usual cab issues found on most Derby-designed first generation DMUs is present despite the heavy modifications made by Network Rail. It seems that both ends weren't party to the extensive work that took place around 15 years ago. Work started at No.1 end (which is the south end; the end facing Duffield) with the fibreglass dome being removed to reveal the usual rot in the cant rail areas. The bottom of the cab was also noted to be rotted through on the support pillars and these have been repaired already. Work is now progressing on the cant rail in preparation for putting the dome back on. The aluminium cab window surrounds have been stripped of all their old paint and reinstalled into the window holes ready to receive new glass (remember the windows were either missing or smashed). It is anticipated that the other end may have to have this work done as well as you can physically see inside when looking along the gutter at the top of the cab! Lots of other random holes were uncovered, many of which are just in the sheet steel and not in the structure. Gradually, these are being repaired as and when possible but as you can appreciate, its all very time consuming doing little patches. The area has to be measured, new steel cut, then the old cut out before welding the new piece in. The seams then have to ground, filled and primed as necessary. This work was slowed down further by the vehicle having to be outside. 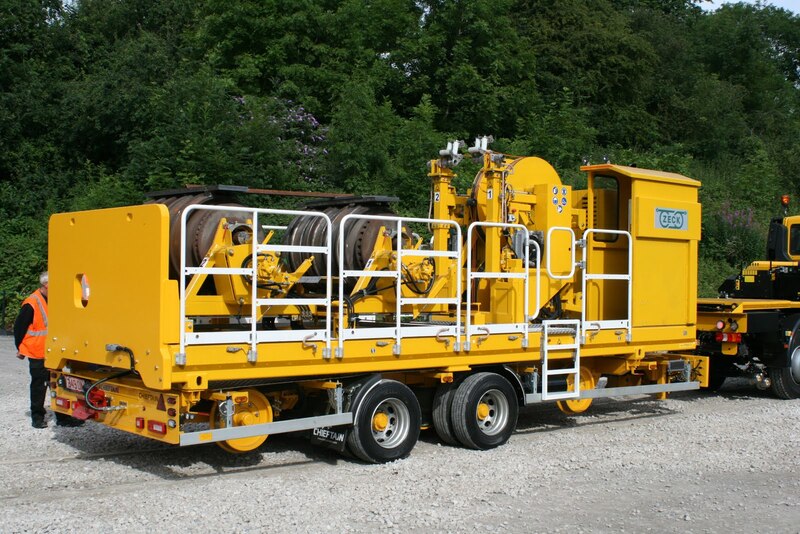 This is just one of those things as service vehicles must take priority if they need urgent work. Most of the No.2 side (the west) side has now received a coat of some sort of paint. Some of it is in primer and 2/3 in undercoat. It is important not to leave primed areas exposed too long as the air can bring rust through primer once again. It was a good excuse to use up paint already in store which is why the undercoat is an unusual shade of pink! This side does still need some more work as there's quite a large section at the No.1 end which requires a sheet welding in. This patch goes right from the bottom up to the gutter and is probably around 4 foot wide. 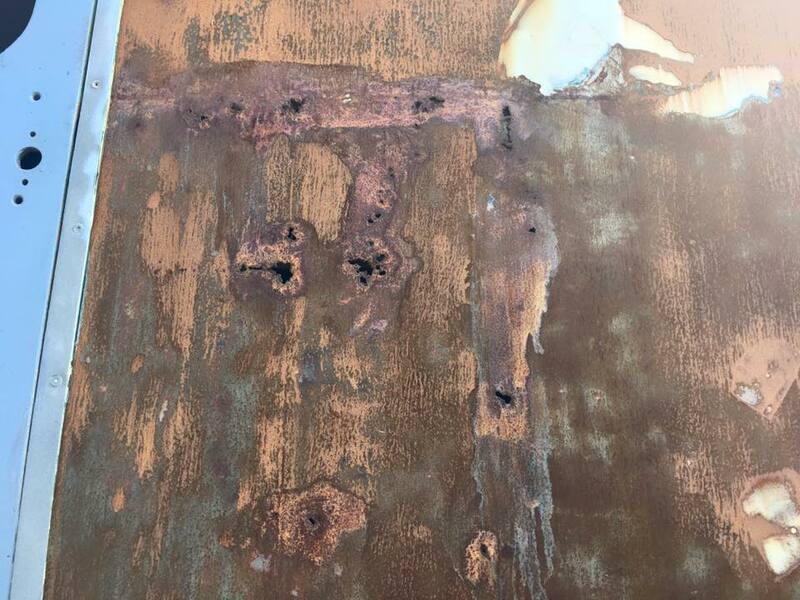 Similar has been done on the roof with all of the rusty areas receiving treatment and the ventilators being resealed so that they don't leak. The roof is gradually being painted into primer, ready to receive further paint. The Leyland 680 engine which was on the vehicle when it arrived has been taken off and assessed. It doesn't seem too bad and was given a deep clean so that work can be undertaken on it as necessary. It's missing some components, such as an injector pump and a starter motor but these can be fitted. Another engine is required and a source has been identified for following up. It is currently thought that a water tight and presentable body shell will be produced for the PW team to modify inside over the winter and potentially haul around dead. Then, next year when the weathers warm again, work can take place on the underneath to try and move towards it being a self-propelled DMU again. The most major of all of this work is the body lift to allow the bogeys to be swapped with those currently under sister unit 977976 which is being used as a store. The wheel sets currently under Barry are painted red and very worn. In fact they're not even matched and are likely to have come from 'bubble cars' still running on the main line. One of them has a smashed final drive dog too which renders it basically useless - probably done as a result of changing direction with the air pressure too low, changing direction whilst the vehicle is moving or dragging the vehicle at speed without the drive being isolated. Hopefully, an upgraded facility at Wirksworth will allow for proper lifting equipment to make this task much simpler. So, there's a lot to be done and it all has to take place as and when time allows. As mentioned previously, service fleet take priority and there's a lot of demand on those vehicles in the summer months but work progresses slowly in the background. It is comforting to know though that shareholder funds are available as and when we get to the particular component that they sponsored. Finally a gorgeously sunny and warm day for the second day of our Transport Weekend. Exactly 60 classics attended including cars, bikes and lorries. These were backed up with traders on the platform. The Catering Dept particularly had a good day with the addition of a small prebooked party. Down the yard, the Maintenance Team struggled once more with No.1 fuel pump on 50253. Faraday received some attention with a sander too. 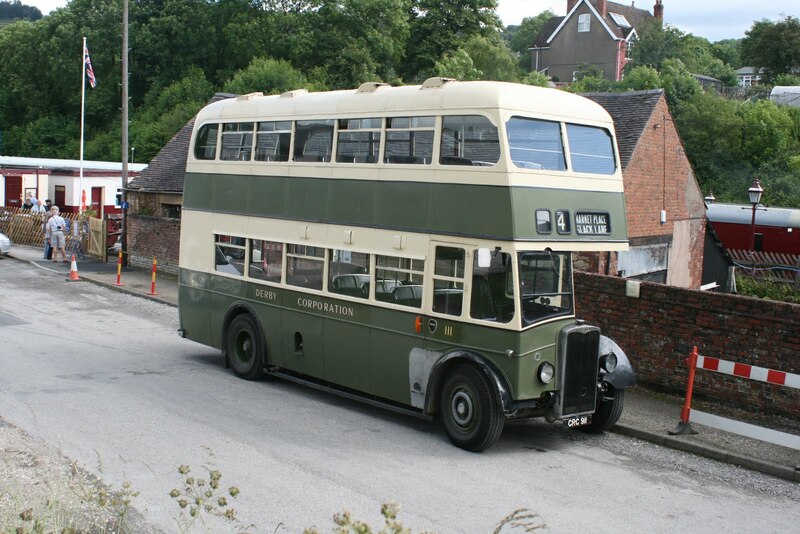 Some slightly better weather today ensured day one of our Vintage Transport weekend was well attended with the scheduled Duffield service being busy throughout the day. Following a driver experience this morning the steam service on the incline proved extremely popular and extra services were added to the timetable to cope with the demand. In the metropolis of Wirksworth Wyvernrail PLC held their annual general meeting with many visiting shareholders enjoying a round trip to Duffield before the meeting. Down the yard the LMSCA and 'the Duke's' restorers were in attendance together with Faraday's owners who continued their efforts to prepare the loco for its fitness to run examination. The DMU restoration team worked on 50253's fuel pump. I am pleased to report that this year's spitfire pilot found the right railway and our visitors and volunteers enjoyed the sounds of a Merlin engine as the plane did its passes over Wirksworth yard. Today's service was supported by the EVRA Shop and Model Railway. The Pullman Buffet staff were also kept very busy throughout the day. Thanks to everyone who helped to ensure the event was so successful. Roll on tomorrow. This morning you could see the tumbleweed blowing around the site with just three people signed in. Not too surprising considering it wasn't an operating day but it did make it very quiet. One of the people was Nick, who is restoring the LMS coaches and another was our esteemed Infrastructure Manager who took delivery of the new gates for Wirksworth Station's north foot crossing. It wasn't long though before things began to liven up. 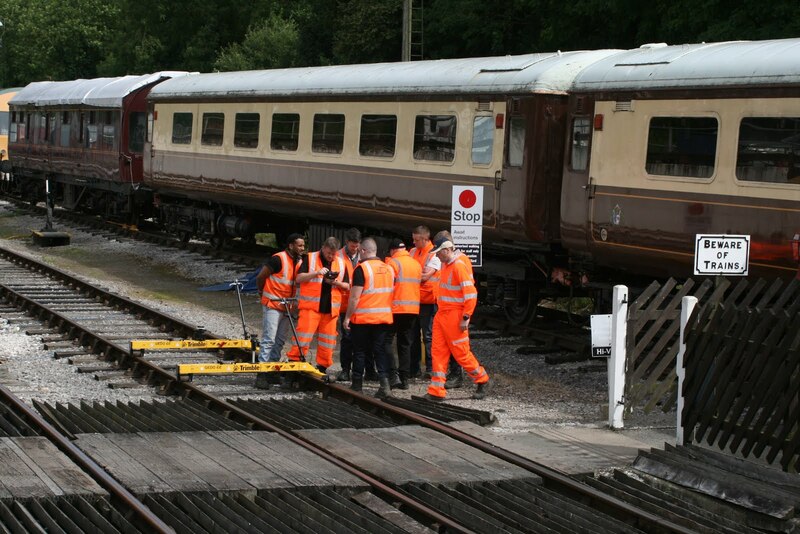 The Catering Department began to lay up and prepare for this evenings dining train to Duffield. It takes most of the day to set up and prepare for just a couple of hours in the evening. The train crew arrived with plenty of time too. The tram people did pop in for a couple of hours also. Finally some sun! The train service got off to a slow start but was happily busy enough to warrant two cars today boosted by a school party and another private party who had tea in the buffet too. Thanks to Lewis Chuck who stepped in at the last minute (literally) to cover Third Man duties due to late unavailability of the rostered person. I popped down to Duffield to meet with a new volunteer who is an electrician and it was great to see the progress on the new Booking Office. The sunny weather allowed a team of three to carry on with the exterior paint job which is being done to a very high standard. I attach a photograph of Jim, normally driving, helping out with the painting and also a view across the station with our train, the new building and EMT in the background. 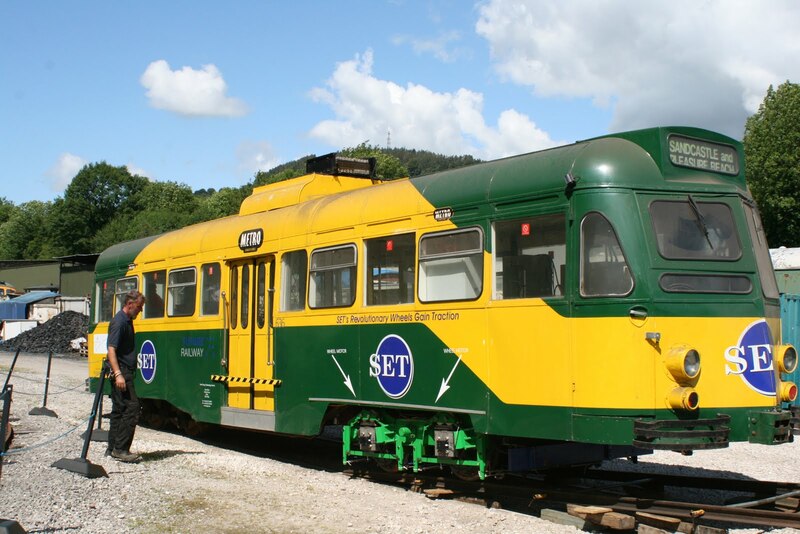 At Wirksworth, our tram car test customers were on site and the DMU team worked on 50253 tirelessly including fitting a new starter motor and injector pump. Unfortunately, it's still not cured! Derek and Dan worked on BSK 34625 in their quest to put the compartments back together too. The PW team were working at Barnsley Lane area changing sleepers and the new Idridgehay crossing gates were noted to be receiving a coat of paint. The 11:05 Duffield service see off in the rain but returned in glorious sunshine. Good passenger numbers were enjoyed throughout the day. 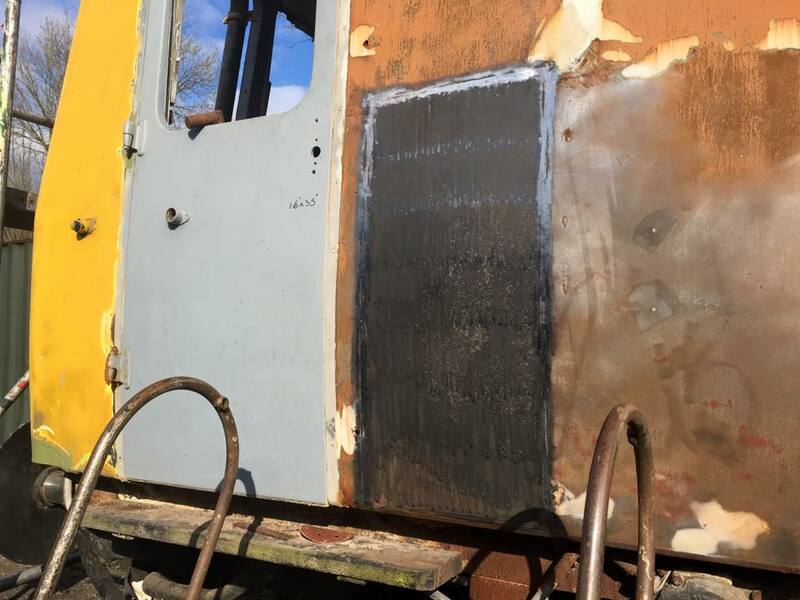 The permanent way team could be found working along the 'racing straight' and the LMSCA took a leaf out of the quick fix fitter's book and replaced a defective seat in the dinning car set in record time. Progress Report Wednesday 13th July 2016 Photos! The first vehicle for this start up company arrived today and will eventually provide smooth and regular transit between Wirksworth Station and The Malt Shovel. The quiet solitude of today's Booking Hall at Wirksworth put me in mind of sounds that I would like to hear coming up the Valley although Eric and Helen may have trouble serving afternoon tea. What has happened to summer? Another morning of torrential rain followed by intermittent dry spells after lunch certainly took its toll on early visitor numbers. However, thanks to pre-booked coach parties our early and mid afternoon services enjoyed good passenger numbers in the circumstances. The steam team played host to a footplate experience and it was pleasing to see a coach party from the Isle of White who visited us on Thursday, return to enjoy steam on the incline. Thanks must go to Richard and Owen who stepped in at short notice to cover operational roles due to volunteer sickness. Down the yard, despite the weather, work continued with the Duke and Faraday receiving attention as well as the LMSCA who were gainfully employed. Today's services were supported by the EVRA shop, Model Railway and Pullman Buffet who catered for a birthday celebration and a number of wet passengers seeking shelter from Wirksworth's wet weather. Here's hoping the warm and sunny summer is just around the corner. Today's photo is of our Isle of White visitors and their vintage bus. 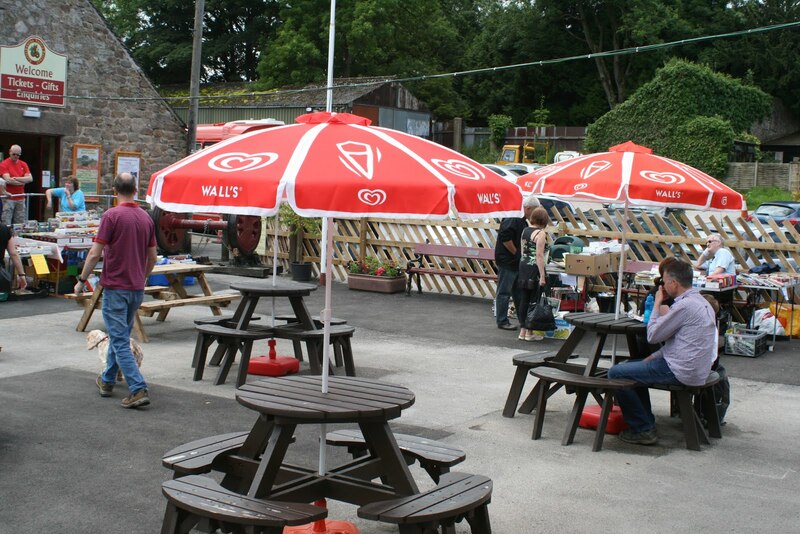 A fairly leisurely Friday down at the railway today as it is always the lul before the weekend. 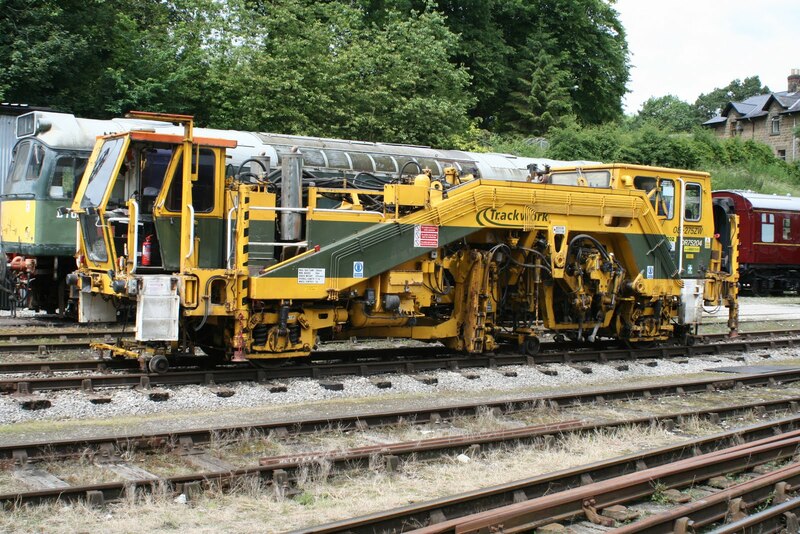 The tamper which has been on site nipped down to the section that has been fettled this week and tamped the track there before coming back to Wirksworth and departing site back to the main line. A shunt of the shed area was undertaken to put the Derby Lightweight trailer car in the shed for attention to its roof following completion of the work to seal up the roof on the partnering power car. Also in this shunt, Taylors Road was cleared ready for a customer to do some testing this coming week. Derek and Dan were working in the BSK to put the compartments back together and the Catering Department were preparing for their weekend too. The Station team were again working on the guttering on the Platform Shelter. New guttering was installed last week but further work is required to ensure that it is fully water tight. A grey and drizzly day which started off very quiet indeed but was instantly boosted by a party of 25 at Duffield which had arrived by heritage bus. The rest of the day just ticked along but was slightly up on last year which is positive. The Maintenance Team continued with the C Exam on 51505 inbetween other tasks like shovelling coal out of the yard access roadway and moving deliveries from the station. Not to mention the most important delivery of the day, the chips from town! The team also removed a defective starter motor from No.1 engine on 50253. Alan was at Idridgehay painting the new crossing gates, whilst the PW team were sleeper changing just a little bit further down (or up the hill, whichever you prefer) at Barnsley Lane. 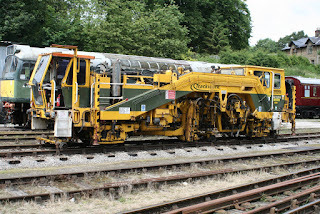 The tamper was in action tamping the 'new' crossover in Wirksworth Yard which forms part of the run round for locomotives between Road 1 and Road 2. It also tamped the plain line from there down to the station on Road 1 which was relaid by Birmingham University students a couple of years back. We also welcomed a new test customer for a brief visit to the incline. The Catering Hotline needed a recharge after another day of calls for tea and evening meal bookings. There's still a little bit of space on next Friday's evening dining train (www.e-v-r.com/eveningdining) but not too many. Meanwhile, the afternoon teas are really busy with one Tuesday at the start of August having over 50 booked on, which is the most they have done so far! It is less than a month until the visiting Class 20 D8098 appears on the railway and we will be taking advantage of it being here and running mainly loco-hauled trains during this time. With this, comes the opportunity to book your group or party into our dining cars for a catering service. The dining cars are available on Saturday 13th, Sunday 14th, Thursday 18th, Saturday 20th and Sunday 21st August when the Class 20 will haul the trains. If you wish to discuss bringing a group or party for catering on the train on any of these dates then please contact the office Tuesday-Friday on 01629 823076 to discuss it. The Class 20 will haul trains at the Diesel Weekend on 6th/7th August (of course) and on Tuesday 9th, Tuesday 16th and Wednesday 17th in addition to the dates above. Another dry day, unbelievable !! The three service trains were easily handled by Iris. 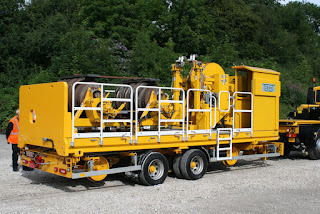 Our latest visitor from Trackwork is a machine designed to pack and level switches and crossings as well as plain line. It is being put to good use on areas that have never had the benefit of such a machine. The other photo is of our Mess Hall that has been treated to an exterior makeover after deteriorating to quite a sad state. Two videos attached in the local station theme with one showing our friends slightly to the north of us. A delightful Classic Bus Day yesterday which was very well attended and a great credit to all involved with a most welcome financial result. The first day of July but it didn't seem like it. Damp and a bit chilly. The Station team were working on the platform 2 shelter today replacing the guttering. The old guttering was falling apart which, of course, meant that it was leaking. There's likely to be a trader in there at Sunday's Bus Rally and so we wouldn't want their stock getting wet in the event of a downpour. They haven't quite finished it but have promised to come back tomorrow morning, which is quite exciting to them as they're not used to working on an operating day! We also welcomed a Drive a Diesel Railcar Day who were ably hosted by Chris B and Roger. They also had a meal in the Pullman at lunch. Down the line, a few members of the PW team were in the process of preparing themselves for the move from the work site south of Hazelwood which is now completed to a new work site near Barnsley Lane bridge.